NEW ULM – Spend a week with Fr. Zach Peterson and you’ll be ready for a week’s vacation. Not only does he celebrate four Masses every weekend in Ortonville, Rosen, and Nassau, but he also visits parishioners at nursing homes, attends parish council meetings, and makes late-night emergency visits to the hospital. By the time Monday rolls around, he’s ready for his day off. Before becoming a priest, Fr. Peterson was a middle school English and social studies teacher for a year and a half. He owned a home and two cars and enjoyed playing a round of golf in his spare time. The high point of his week, though, wasn’t when he was helping a seventh grader refine a five-paragraph essay, nor when he was pumping his fist after making a birdie. It was on Wednesday nights when he was teaching Confirmation class to high schoolers at Our Lady of Victory Parish in Lucan. So in the fall of 2004 he took a leap of faith and began to study for the priesthood. He sold his cars, put his house on the market, and travelled 210 miles north to Fargo, N.D., to attend Cardinal Muench Seminary. Seven years later he was ordained a priest. In the eyes of the world, Fr. Peterson’s decision doesn’t make sense. Why give up a wife, family, career, and possessions to be a glorified parish manager? What makes the priesthood so special that a man would be willing to sacrifice so much for it? For Fr. Peterson, the primary reason was that God wanted him to be one. While he could have been happy as a teacher and biological father, he wouldn’t have been doing God’s will, he said. His attraction to the priesthood, however, ran deeper. He saw that priests were able to bring Christ to others in a special, powerful way, whether they were proclaiming the Gospel, hearing a confession, or celebrating the Eucharist. Since being ordained two-and-a-half years ago, he’s still getting used how God works through him. “To be that custodian of Christ’s words and to know that Christ will act when I speak words, it’s really overwhelming,” he said. Like Fr. Peterson, the “Fourth Plan for Parishes” recognizes how important ordained priests are for the life of the Church. Already in its second chapter it states they receive a “sacred power … at ordination” that enables them to represent “Christ as Head of the Church” (p. 7). But it also highlights the critical role husbands, wives, nuns, students, religious brothers, consecrated virgins, and all members of the Church play in building up the Body of Christ. In fact, it teaches that all the baptized – not just the ordained – are called to participate in Christ’s priesthood. Douglas Bushman is a professor of theology at the Augustine Institute in Denver and an expert in the theology of the Second Vatican Council. Since both the royal and ministerial priesthoods are participations in the one priesthood of Jesus Christ, he said, it’s important to understand how Christ was a priest. Baptized Catholics, then, are called to participate in Christ’s priestly self-offering to the Father, he said. This fact is affirmed in the New Testament when St. Peter tells his readers they “are ‘a chosen race, a royal priesthood,’” as well as when he exhorts them “to offer spiritual sacrifices acceptable to God through Jesus Christ” (1 Pt 2:9, 5). These passages are part of a larger reflection in First Peter on the nature of Baptism, Bushman said, indicating that in the mind of St. Peter, Baptism enables one to participate in Christ’s priesthood. The “Fourth Plan” affirms this when it states that everything baptized Catholics do can become an offering to the Father: “All their works, prayers, and apostolic endeavors, their ordinary married and family life, their daily occupations, their physical and mental relaxation … and even the hardships of life, if patiently borne – all these become ‘spiritual sacrifices acceptable to God through Jesus Christ’” (p. 5, quoting the Second Vatican Council’s “Lumen Gentium,” no. 25). To exercise the royal priesthood of the baptized, then, is to imitate Christ as a prophet, priest, and king in one’s daily life (see Catechism of the Catholic Church, no. 1268). An example Bishop LeVoir gave of someone who embodied this was the 20th-century laywoman and social activist Dorothy Day. “She loved Our Lord in the Eucharist, was activated by the Eucharist, and went out to live that life by treating everybody with dignity and respect,” he said. Day’s heroic, Christ-like commitment to serving the poor, however, wasn’t something she produced on her own. Rather, like every other Catholic who’s followed Christ, she relied on the ministerial priesthood to activate the prophetic, priestly, and kingly offices she received at Baptism. An image Bushman used to describe this relationship between the ministerial and royal priesthoods was that of a vine giving life to its branches. Just as a branch needs to stay connected to the vine to produce fruit, so too does the royal priesthood have to stay connected to the Church if it wants to be fruitful, he said. That’s where the ministerial priesthood fits in. It connects the baptized to Christ and his Church. Or, as the “Plan” puts it, it “activates” the royal priesthood of the baptized. Ordained priests are able to do this because they’ve been configured to Christ through the Sacrament of Holy Orders, the “Plan” states (p. 3). They can “‘act as … representative(s) of Christ, Head of the Church, in his triple office of priest, prophet, and king,’” such that when they do certain things, Christ himself does them (p. 3, quoting no. 1581 of the Catechism). For example, when a priest says the words of consecration at Mass, it’s Christ who’s saying them and re-presenting the sacrifice he made on Calvary. This enables the laity to exercise their priestly office by offering up their lives in union with Christ’s sacrifice. Or when a priest teaches the truth about God in conformity with the Magisterium (the teaching office) of the Church, he’s teaching with the authority of Christ, Bushman said. This activates the prophetic office of the laity in that they’re able to pass on this truth to their families. One way Fr. 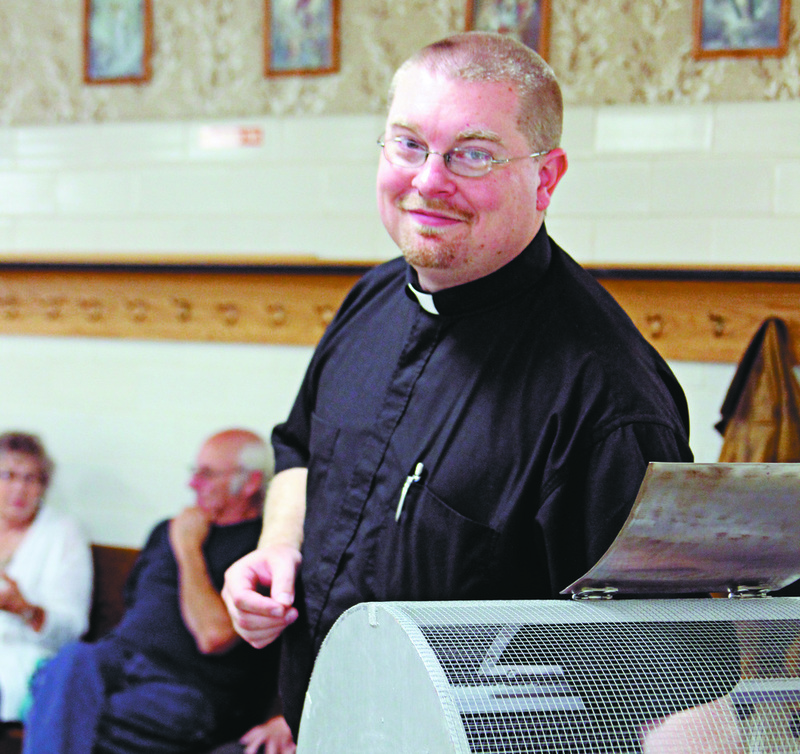 Peterson activated the laity at his previous assignment, St. Anastasia Parish in Hutchinson and St. Boniface Parish in Stewart, was by helping lead a Squires circle. The Squires program is a junior version of the Knights of Columbus, open to boys ages 10 to 18, that has them pray, learn about the faith, and serve their parish and local communities. No wonder, then, that Fr. Peterson and thousands of others have been willing to sacrifice so much for the priesthood. They get to help others become holy. The teaching the “Plan” presents on the royal and ministerial priesthoods will have practical implications for pastoral planning in the diocese. One change involves the appointment of priests and lay faithful as leaders in parishes. Throughout the Church’s history, baptized Catholics have worked with priests “to build up the life of the Church,” the “Plan” states, whether as teachers, religious education catechists, lectors, or pastoral council members (p. 7). One group that has helped care for parishes in the Diocese of New Ulm over the last 30 years is pastoral administrators. The Church’s Code of Canon Law defines a pastoral administrator as a deacon, person who is not a priest, or community of persons who has been given some “participation in the exercise of the pastoral care of a parish” due to a shortage of priests (can. 517 §2; see p. 10). In the Diocese of New Ulm, women religious, a deacon, and lay faithful have served in this capacity (p. 10). The “Fourth Plan” calls for parishes to be led increasingly by ordained priests assigned as pastors and not by pastoral administrators. Part of Bishop LeVoir’s decision to do this is based on a 1997 instruction approved by Pope John Paul II that clarifies how canon 517 §2 should be interpreted. The instruction states that while there are situations where a bishop may appoint a pastoral administrator to care for a parish, the circumstances that necessitate this should be “exceptional” (p. 11). Other options should be investigated first, including having one priest serve as pastor at multiple parishes or having a retired priest help out (p. 11). More fundamental to Bishop LeVoir’s decision, however, is his and the Church’s understanding of what happens to a man when he is ordained. Priests are configured to the person of Christ in his prophetic, priestly, and kingly offices. These offices “form a single indivisible unity founded on the singular, indivisible priesthood of Christ,” the “Plan” states (p. 11). While one can say certain activities a priest does predominate in one office, one can’t say that they fall exclusively in that category, Bushman said. For example, when a priest offers up the Sacrifice of the Mass, he is clearly exercising the priestly office of Christ. This manifestation of Christ’s love for his people, the “Plan” states, will elicit in the laity a love for Christ and, therefore, a desire to know more about him (p. 11). They will turn to their priest to teach them the truth about Christ, that is, to exercise his prophetic office. Furthermore, the love they experience at Mass will compel them to exercise their kingly office by serving others through apostolic works (p. 11). The priest, then, will be called on to exercise his kingly office by helping direct these efforts (p. 11). This unity of a priest’s offices, then, suggests that the person who provides for the sacramental needs of a parish should also be in charge of teaching and governing, the “Plan” states (p. 10). To help make this vision possible, the “Plan” calls for a single priest to serve as pastor of all the parishes in an area faith community. Already 16 of the diocese’s 23 AFCs are doing this. This shift doesn’t mean that AFCs will only have one priest, just that the parishes in the AFC will have a single pastor. Current pastoral administrators will be allowed to complete their terms of service and even apply for new terms if they are eligible, the “Plan” states. Bishop LeVoir will simply need to “be careful to observe the requirements of canon law and its clarification by the 1997 Vatican instruction” in appointing them (p. 12). In the end, the greatest change that Bishop LeVoir wants to see come about from the “Plan” is a diocese whose Catholics – laity and ordained – are participating in Christ’s priesthood with greater vigor. That’s what will transform society.